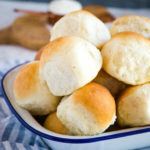 These Easy Homemade Classic Buttermilk Buns are the perfect tender dinner roll! A simple buttermilk dough baked to perfection - perfect for the holidays! Add the yeast, water and sugar to a small bowl and combine gently with a fork. Set aside to rise for about 5 minutes. Add the buttermilk to the bowl of your stand mixer fitted with the dough hook attachment (or in a large mixing bowl if you're going to make by hand). Add the sugar, salt, baking soda, and melted butter, and mix gently until combined. Add the yeast mixture and then the flour, turning the mixer on low speed until a very soft dough forms. Continue the mixer on low speed, turning up to medium-low speed until the dough pulls away from the sides of the bowl. The dough will be soft and a little sticky - that's totally normal. If making the dough by hand, turn it out onto a floured surface and knead for about 4-5 minutes until a soft and sticky dough forms. Cover the bowl with plastic wrap and let rise in a warm, draft-free place for 90 minutes or until the dough more than doubles in bulk. Punch the dough down and turn it out onto a lightly floured surface. Give the dough a quick knead and form it into a large ball. Using a sharp knife cut the dough in half, then in half again, and then cut each of those pieces into 6 equally sized pieces. Roll each piece into a round ball and place on a baking sheet greased with butter and lined with parchment paper. Preheat your oven to 375 degrees Fahrenheit and cover the pan of buns with a clean kitchen towel and let rise for about 20 minutes while the oven pre-heats. Once the oven reaches temperature (after at least 20 minutes) brush the tops of the buns very gently with melted butter (optional) and bake for about 22 minutes or until the buns are golden brown on top. Let the buns cool on the pan for at least 15-20 minutes before serving. These buns can be made a day ahead of time and stored in an airtight bag or container until time to serve, however they are best enjoyed the day they're made. This recipe makes 24 dinner-roll sized buns, but it also works for 18 slightly larger buns if you'd prefer. Adjust the baking time by a few minutes.